What does it take to become a project manager? Scheduling software producer LiquidPlanner has compiled data about people currently working as project managers to show what characteristics this diverse group of individuals have in common. The first thing to notice about project managers is that more than three quarters of them are male; women make up only 22% of the 16 million people who describe themselves as project managers. Men also earn more on average, with the average male project manager bringing home between $59,368 and $98,783, whereas the average female range is slightly lower, at $52,148 – $87,338. 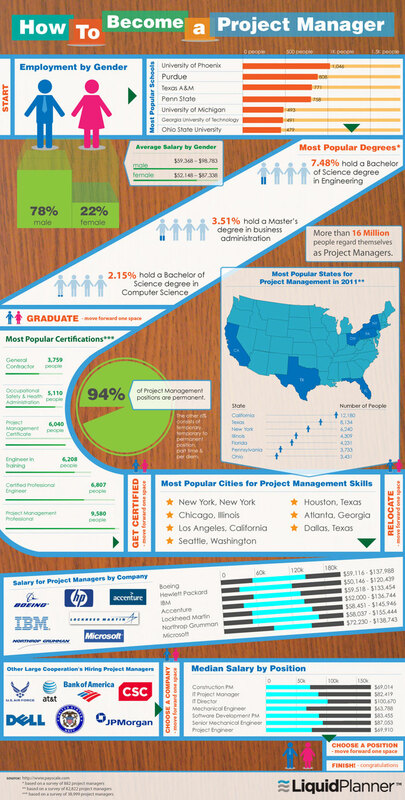 The first step along the road to becoming a project manager is often to get a degree. The subjects studied by project managers vary widely; 7.48% of project managers hold a Bachelor of Science degree in engineering, while 2.15% hold the same qualification in computer science. Only 3.51% gained a Master’s degree in business administration. Some schools seem to be more adept at producing project managers than others, with the University of Phoenix, Purdue, Texas A&M and Penn State leading the way. After graduating college, many would-be project managers gain a further certification. Becoming certified as a Project Mangement Professional is the most common route, but others become Certified Professional Engineers, Engineers in Training, or gain a Project Management Certificate. Although 94% of project managers hold permanent posts, it might be necessary to relocate to find such a position. The states employing the most people as project managers are California, Texas, New York and Illinois. Within those states, the big cities offer the best chance of employment; New York City, Los Angeles, Dallas, Houston and Chicago are among the top U.S. cities for the number of project managers that are employed there. Which companies pay their project managers most generously? Some of the highest recorded salaries are paid by Northrop Grumman, which pays project managers between $58,037 and $155,444. Other companies that top the salary leaderboard are Boeing, Hewlett Packard, IBM, Accenture, Lockheed Martin and Microsoft. Project managers who are looking for work should also consider other big corporations such as Bank of America, J. P. Morgan, AT&T and Dell. Project managers are also needed in military organizations such as the U.S. Air Force and United States Navy. Project managers can hold various job titles which reflect their particular role within the company. Some common titles include construction project manager, IT project manager, software development project manager, and project engineer. Project managers working in IT roles are among the best paid, with IT directors taking home a median salary of $100,670.